Our goal is to make running your business easier. 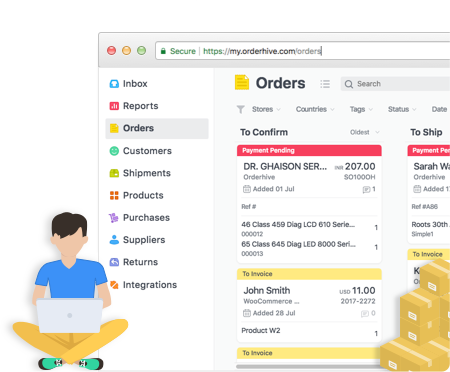 Orderhive is a SaaS-based web and mobile software application that centralizes all your business channels—inventory management, order processing, shipping, invoicing, and tracking—everything—into one simple, easy-to-use piece of software. Orderhive integrates with over 350 different channels so you can do everything you need to run your business smarter and smoother from one single piece of software. This is Orderhive. We’re here to streamline the way online vendors like you operate, all around the world. Before creating Orderhive Niraj worked for Amazon as a supply chain and finance manager, so he’s experienced firsthand the issues and opportunities that online vendors are faced with. This experience was what planted the seed for Orderhive. Niraj has also completed a Masters in Business Administration with a Major in Finance, and a Double Minor in Marketing and Analytics, at Kelley School of Business. Before creating Orderhive Jayneel worked as the founder and CEO of OpenXcell, an enterprise mobile app design and development company—so he knows what works when it comes to a smoother, more efficient app design. Jayneel studied Computer Science and Engineering at Gujarat University. Our values define our culture and how we work. We believe that honesty should be at the foundation of every action, which gives confidence and meaning to the actions we take and drives the way we work. That’s right—not just customer satisfaction, but delight. We want to make sure you love what we do, so we consistently act on our customer feedback to give you a better user experience. If you’ve got any questions or concerns, we’ll be here to answer them, and give you exactly what you’re looking for. Without passion action is meaningless. We believe that work done with passion brings out excellence, so we work hard to help business owners like you achieve what you’re passionate about, and what you’ve imagined for your company. A team that clicks is a beautiful thing, and a team that’s happy achieves big things while having fun in the process. We love the discussions and the team focus we have here at Orderhive, which we see brings out the best in us and helps to achieve our goal. We’re open about our policies, team, and working style. We keep you updated about our long-term plans and road-map, and any changes without our company, to ensure that we’re always in sync with your business. We love challenges, and our never-give-up attitude helps us sail through them easily. We dive headfirst into every task and opportunity with passion, enthusiasm, and this attitude, and do everything we can to make the most of every situation.